Welcome to our new Parent Section! There are many helpful resources in this section. Please click on one of the links on the left, or use the search box to find what you need. Not receiving email and text messages? Update your Email address (instructions below), and send a text to 67587 with the message Yes to opt in for text messages. 3. Enter your Email address, click "Save" then click each box under Type of Message, then click the "SAVE" button. You only need to do this once, and it will apply to all of your registered children. Thank You! It is VERY IMPORTANT to keep your email address(es) current. Please make sure your email address is current, or make any changes by clicking on the "Contact Preferences" link. Instructions for this feature are at the top of this page. In the interest of security, make sure to click on the Log Off link when you are done. Be sure to include your name, your child's name, your child's birthday, and the school he or she attends. To view your child's Report Card, please click on the Campus Backpack within the Parent Portal. You do not have to select a student first. Please contact your child's counselor (CHS & CMS) or the main office at the elementary schools should you have a need for a printed report card that is no longer available on the parent portal. Get the latest news and updates from the District via email and text. 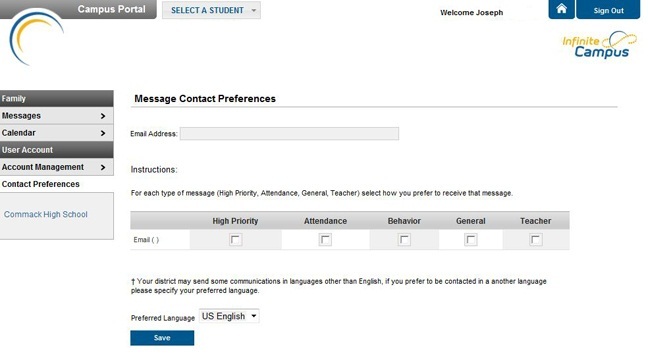 The School Messenger app allows you to control how you receive communications from the school district. Please note: The Commack School District will not disclose your information to other entities to protect your privacy. To comply with the FCC’s Telephone Consumer Protection Act, you are giving the Commack School District permission to contact you via text messages to your cell phone(s) by opting in for the communications listed above. You may opt out at any time.